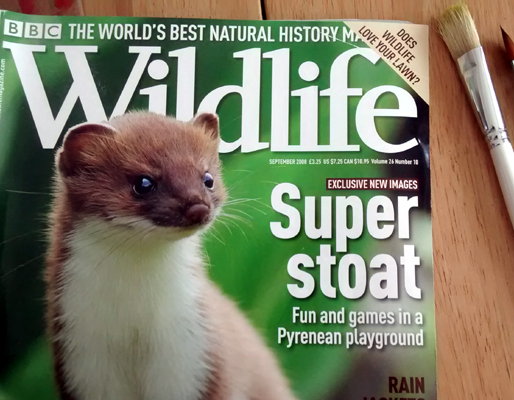 I get the BBC Wildlife Magazine from time to time. I used to have a subscription too. Painting such a complex picture is a something which seesm a bit daunting to me but I’m trying to get better and learn to tackle more complex pictures. So I had a go. Mostly I just used layers of washes for this picture and blended the darker shadow washes into the original colour. This time I also tried to use a dry brush technique to give the moss on the stones a bit more depth. For this I used an old brush with the bristles cut short. Before I’ve only ever dry brushed small metal figures which I’ve been painting so this was a new adventure. It was different from painting on figures – where you’re relying on the raised parts of the figure sculpt to put more paint on some areas and less on others and use can use that shape for some great effects. With paper it’s more about how I wanted th paint to go on which gives me more control and more responsibility. 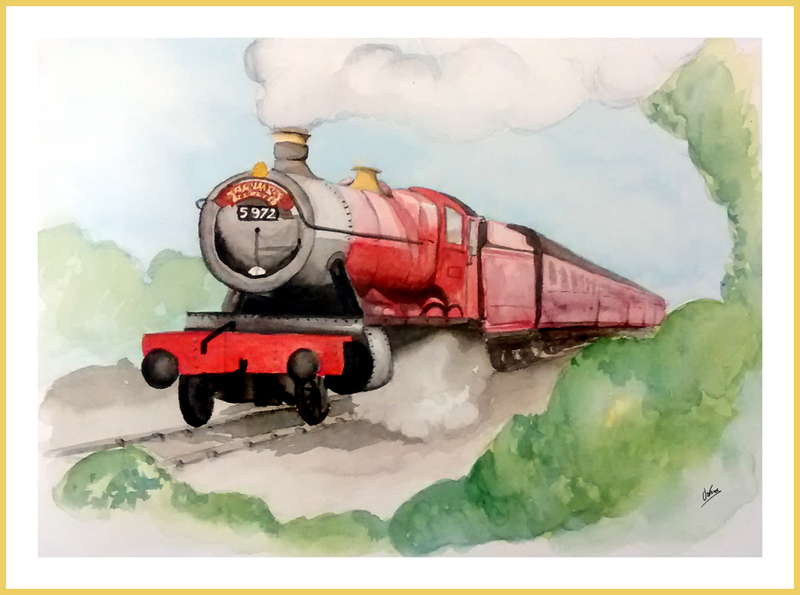 I’ve always loved steam trains. I love the smell of them and the way the train rocks and the sound of the wheels and the engine. 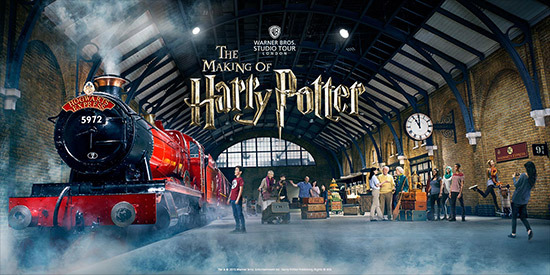 In a couple of weeks time I’m going with my son and a couple of friends from Church to the Harry Potter Studio Tour. I can’t wait!! I’ve hear that you can now see the Hogwarts Express there too!!! 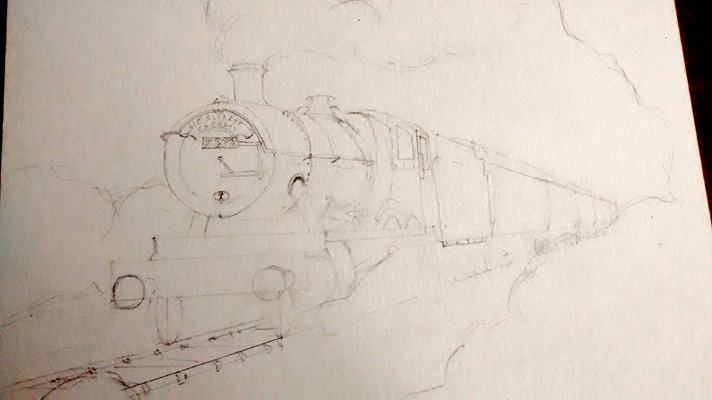 So thinking about all of this I downloaded some photos of a number of steam trains and had a go at painting one today. I’m still feeling quite under the weather, but I love painting and I miss it when I don’t do it for a day so I had a go. My thinking was that I would not put it up here in a post if it turned out too bad! Most of the way through I was thinking that it wasn’t really a good job. I was massively frustrated with my lack of detail but I kept myself to a process where you paint the main shapes first and then the shapes within the shapes and then the shapes within those shapes adn then start joining it together with shadows and light. It really showed me today how painting is an act of faith, becuase at first it looked nothing like what I was going for and, given that I was still feeling unwell, I made a lot of mistakes too – blobs of paint falling onto the paper, painting sections of colour when the adjacent section wasn’t yet dry and getting the paint bleeding through and generally mucking it up all over the place. However, my trusty kitchen roll got me out of most of that and what I couldn’t repair I painted over. The end result is OK but to me feels a bit flat. It doesn’t have that jump-off-that-page beauty which I always a feel a big red steam engine should have. 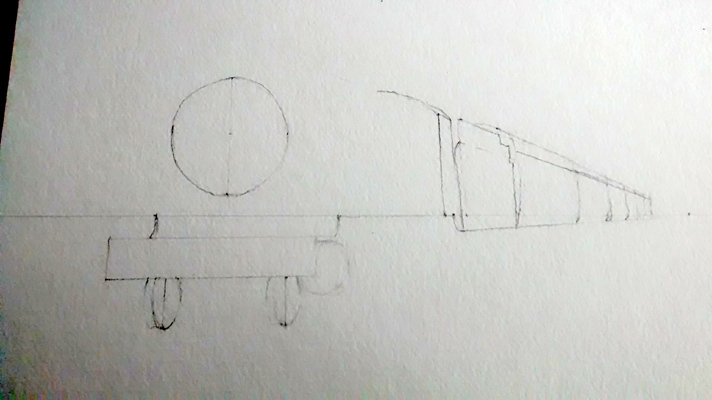 That said at least it does look like a train which is more than it dod at the beginning! I’ve been unwell for the last few days and haven’t been able to paint. I’ve found it incredibly frustrating. I was in bed for a couple of days and ended up dreaming about painting! Fortunately when I got sick I was over a week ahead with this blog so I’ve been able to avoid missing a day when I would normally post. I saw a doctor and got some antibiotics about a week ago so I’m beginning to turn the corner now, although I’m still unfeasably tired and feel really rough when I run out of paracetamol. 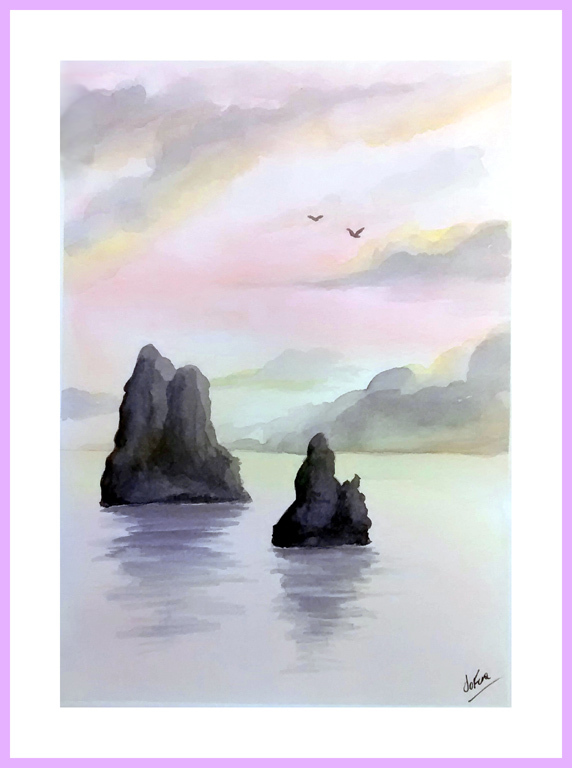 I have been able to spend some time reading about painting and watching some more you-tube videos. One that I saw which was really good (although the lady, Lindsay Weirich, doing it does advertise a photography site which provides royalty-free images a couple of times) was all about painting sunsets. Her video is here. This fitted in nicely with the studying I’m doing in my watercolour book which was talking about how to do a good varigated wash. So I had a go at a ‘Sunset over the Sea’ scene. I mirrored the colours from the sky into the sea with violet at the top and bottom of the picture, then a pink made from a watered down red and then a yellow with a little red in it. As my watercolour training book says I got my paint washes ready before I started so I could work fast. I wet the paper first and then just went for it. Once I’d got the wash done I made a mistake and forgot to pull off the paint I needed for the clouds. So I wet the paper again and then pulled off the paint. Not as much came off as I wanted but it was still noticeable so I carried on. 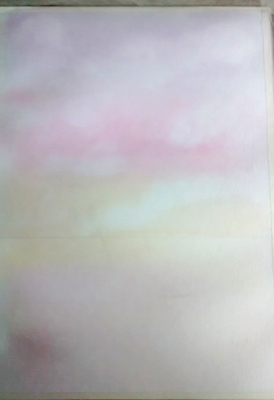 Then I painted the clouds using paynes grey with some purple in it and then added some more yellow clouds with a tiny bit of red to take the bright edge off. I painted my rocks in several washes because I wanted them to have some texture despite being quite dark. I made the nearest rock slightly darker to give the picture a bit of depth and then darkened some of my clouds to balance the tones in the picture a little better. Then I popped in a couple of gulls in the distance (which was really scary because I could so easily have made a big unrecoverable mess of it) and I was done. Looking at the final painting, although the colours are deeper than is shown here, they are still too weak for me I think. 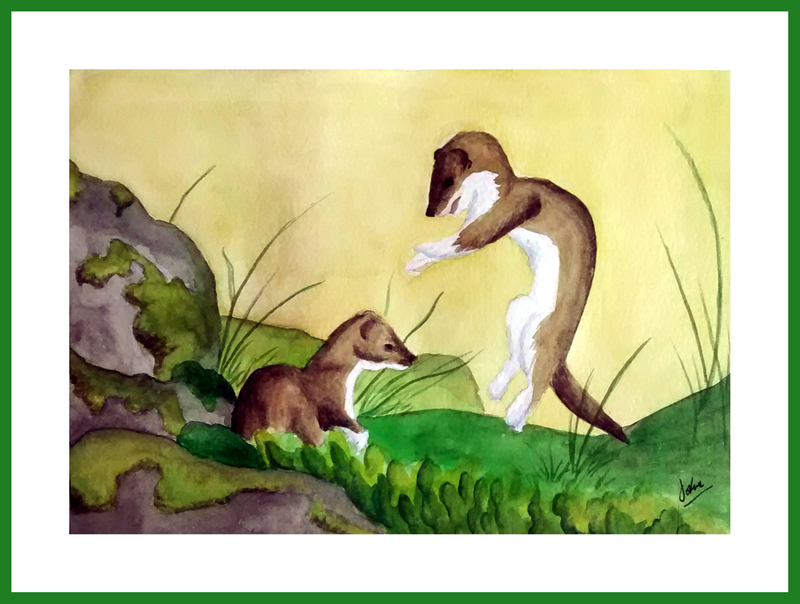 This is the first time with the new paints that I’ve been weaker than I wanted colourwise – previously I’ve always been stronger than planned. So I am pleased about this as I am finally learning to control the chroma of these new paints. 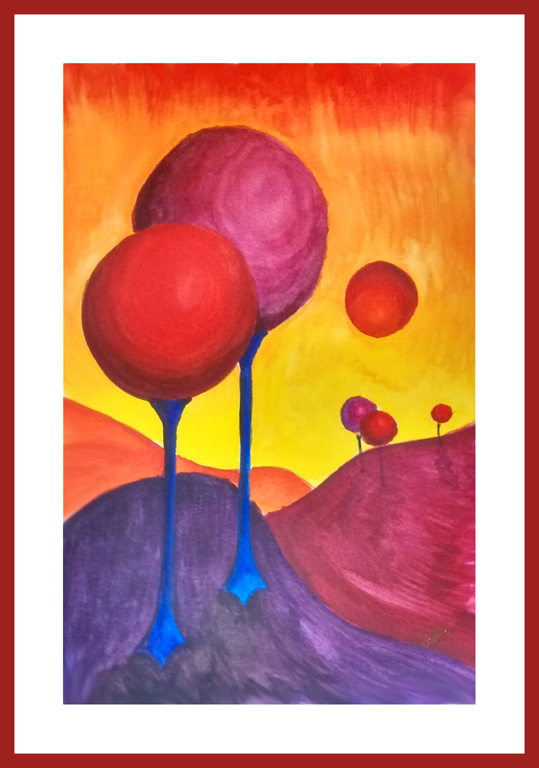 (‘Chroma’ is an artist’s word I learned while reading when I was stuck in bed – it means how intense the colour is – I think!) The other thing I would change is to push the horizon more strongly and work out how to make some watery marks on the sea part of the picture to distinguish it from the sky a bit more. 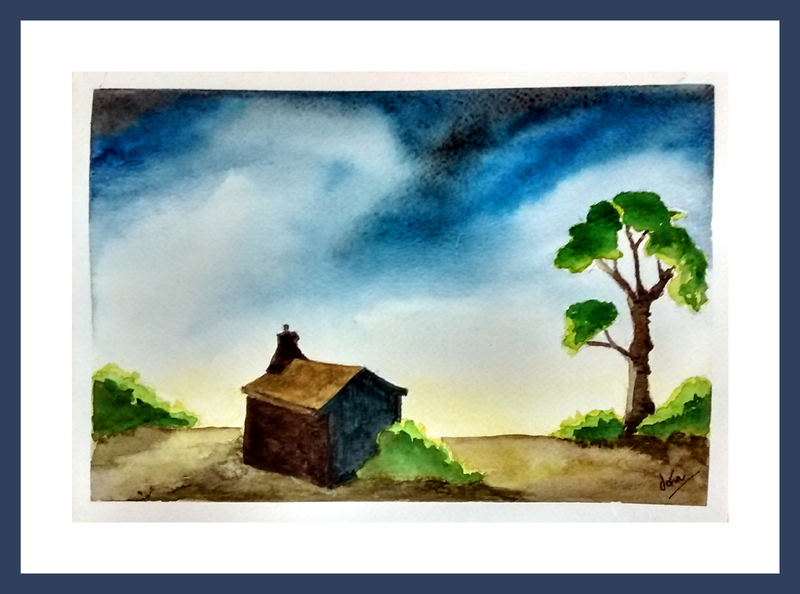 Still – I am pleased with the sky – I think its the best I’ve done so far. I really wanted to try it. I thought it would give me more practice at working with my new paints and be quite fun too! 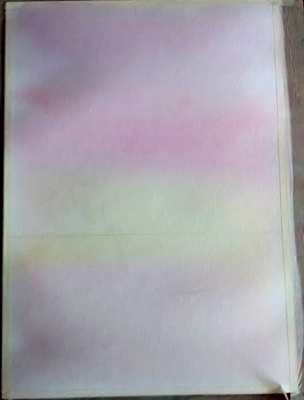 I worked on an A3 piece of watercolour paper. (It doesn’t have a watermark so I just hope I got it the right way around!) I used my new Winsor and Newton Professional half pans. This is the first wash. You wet the flower area and then drop in colour and allow it to mix. Then, with lots of water and paint still there you let it run down the paper. I really like the streaks which come when you blow on it so I did that to encourage it to run. 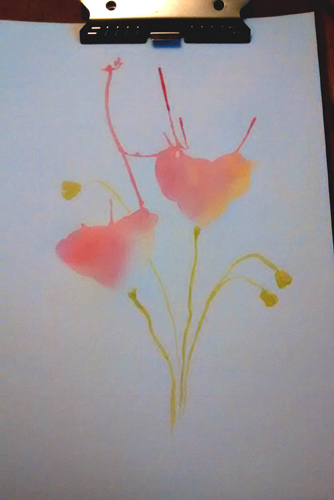 Then you paint in basic stalks and flowerbuds. 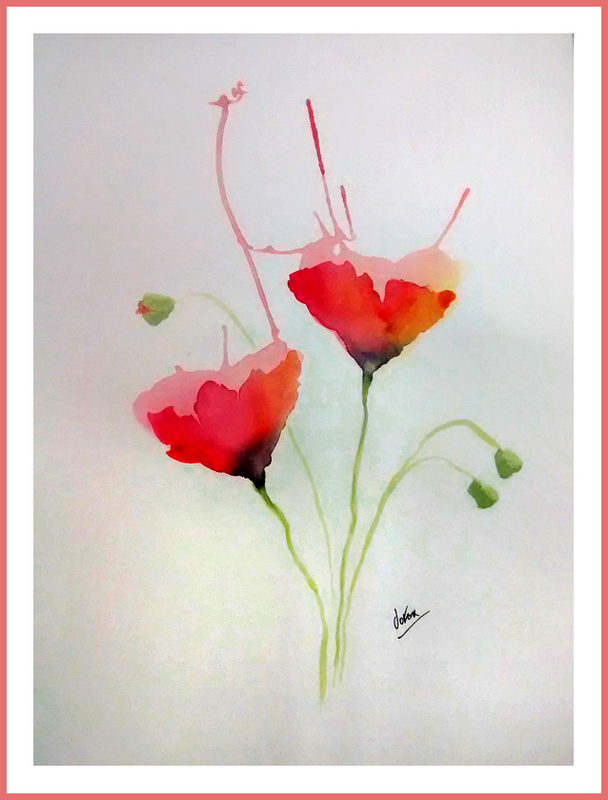 I wanted to have a try with my new paints using this technique. 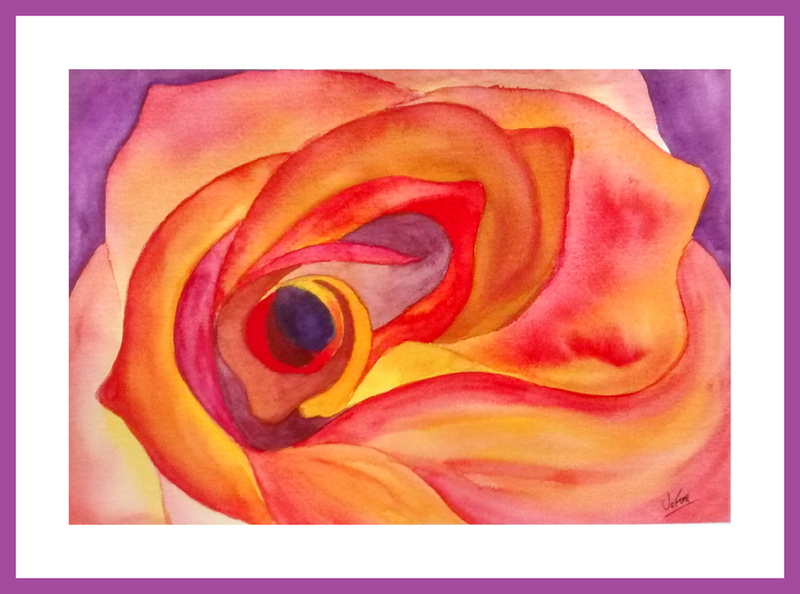 So I found a picture of a rose to use as a basic reference image but I knew that, apart from the shape, I was going to deviate from the reference significantly because I didn’t know what the paint would do. It was fascinating to watch the paint mixing and moving – I got quite carried away with it and worked on this picture for a couple of hours which is a long time for me. 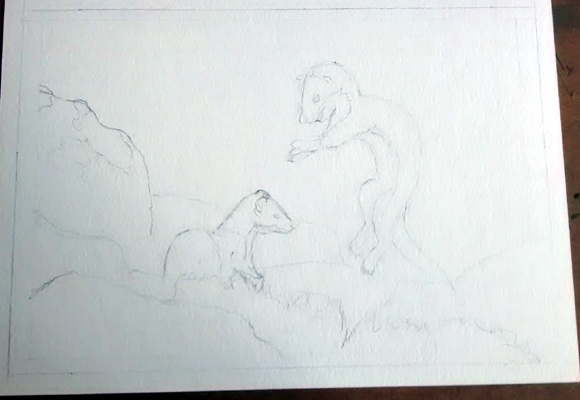 During that time I forgot to take any process pictures – I was just caught up in the painting itself. 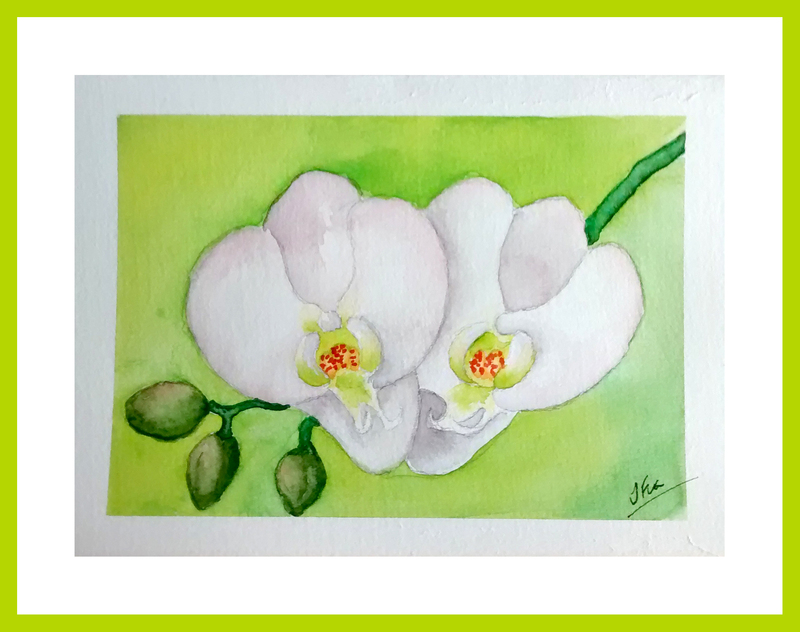 White Orchid Paintings – more colour fun! 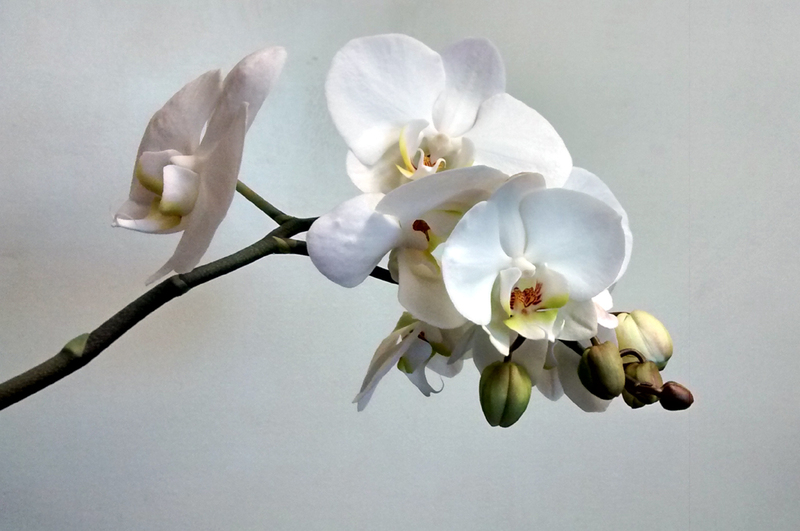 Today I photographed a white orchid I have growing in my kitchen. It was a Mother’s day present from 2 and half years ago. The amazing plant is still flowering! I find the shape and form of these flowers really beautiful. I also love the way this delicate green shades into the flower in the middle. There’s also this delicate pink to the edges of some of the outer petals which you can only see in some kinds of light. 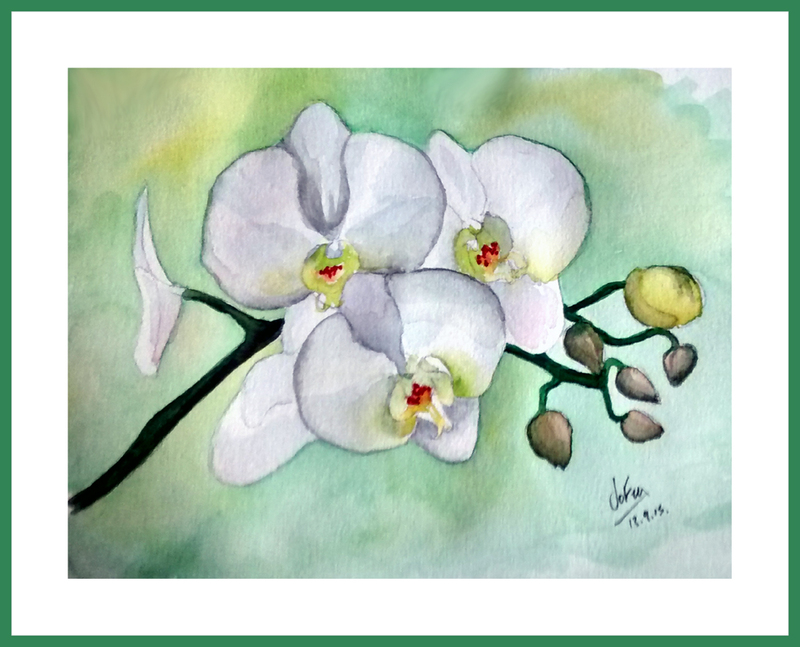 I found the orchid to be quite a difficult subject with it’s complicated shape and very gentle colour. It was really enjoyable to work on though. Rather than work through some more of my watercolour book I want to spend some time getting used to my new Winsor and Newton Paints. 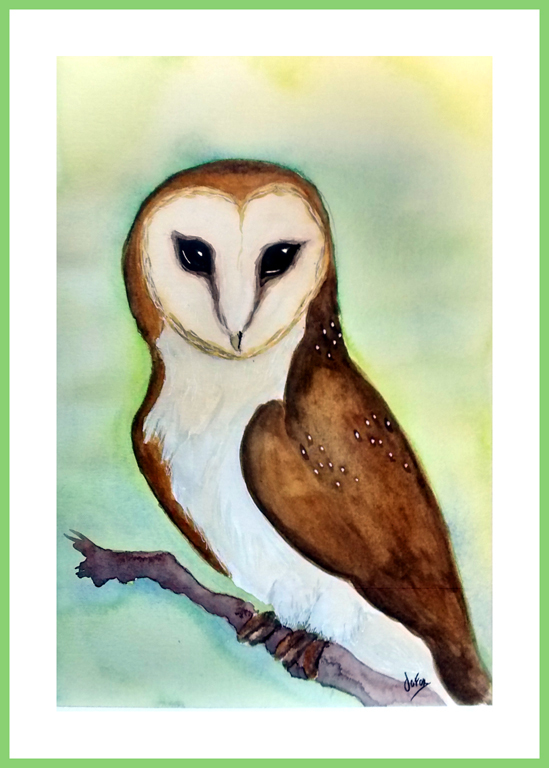 My favourite animal is the Barn Owl. 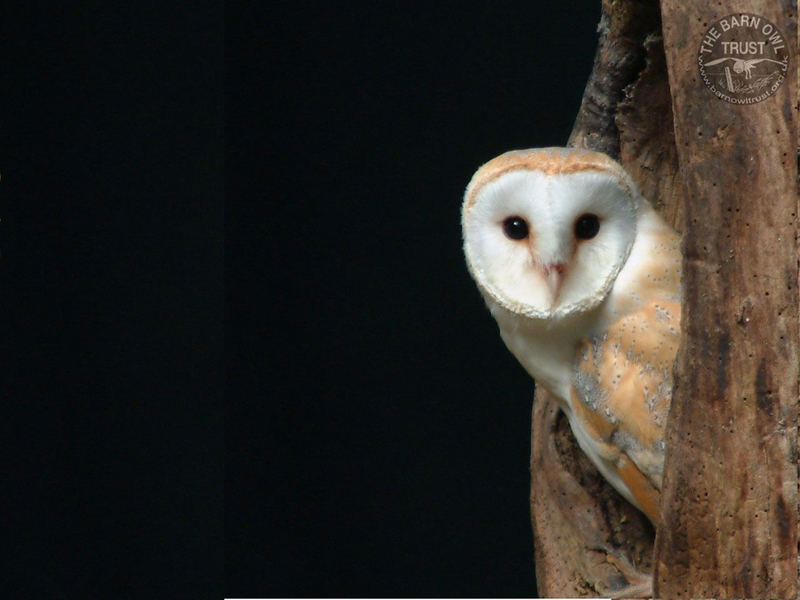 Barn Owls are completely silent when they hunt. The fly really slowly, so much so that they seem to be just hanging in the air. 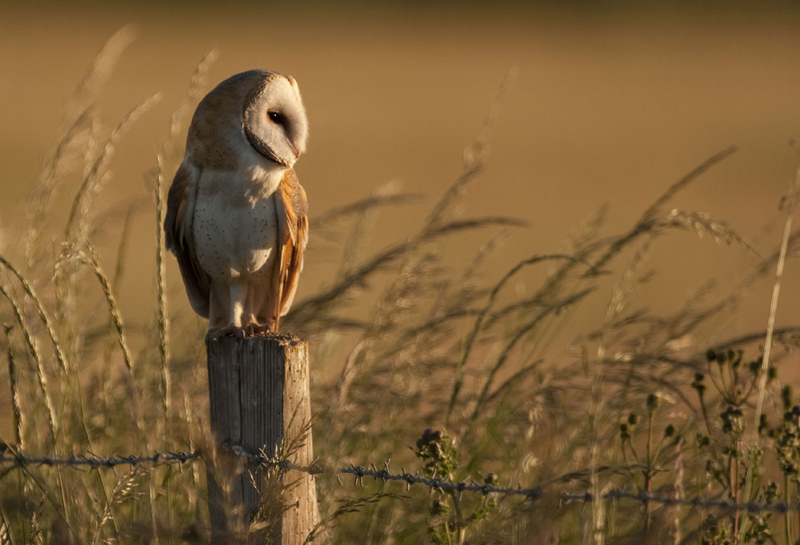 I once had the privilege of watching one in the Cambridgeshire countryside in the early evening just meters from me. It was one of the most beautiful things I’ve ever seen in my life. I hope I never forget it. 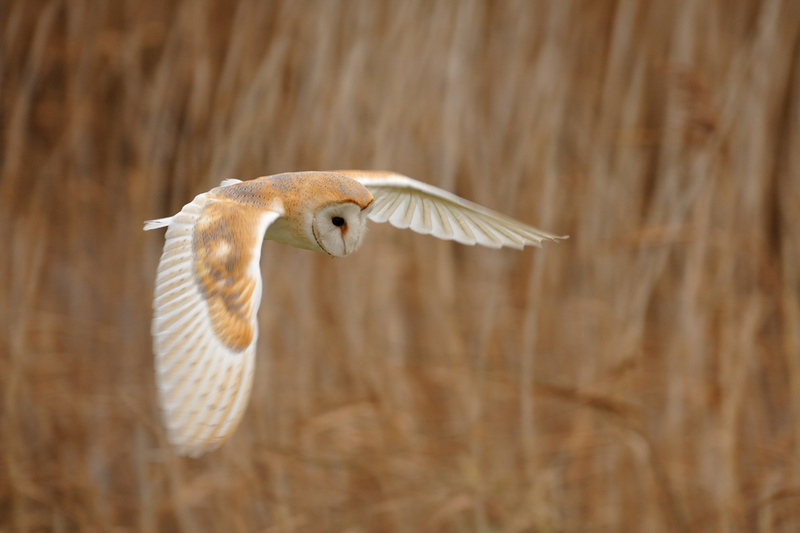 I have a collection of Barn Owl photographs (hundreds of photos) which helps me know the animal quite well visually. 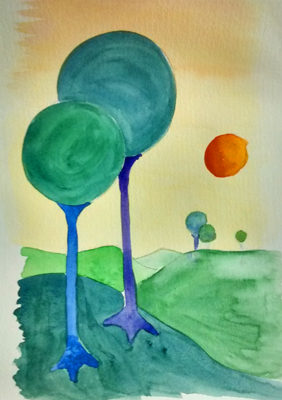 So I decided to paint a picture of one without any reference – from memory. 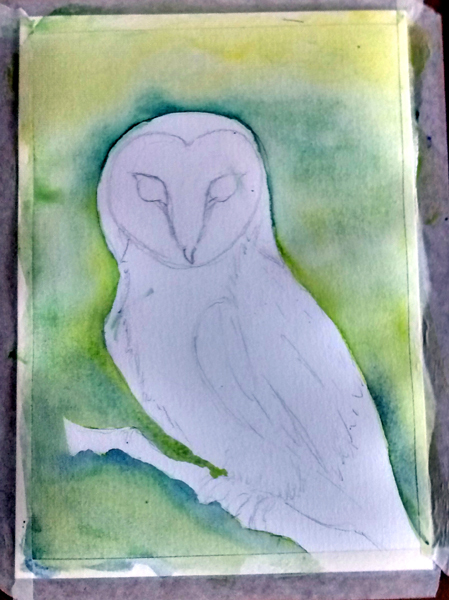 Looking at it now I can see lots of improvements I would make if I painted this again – but he’s recognisably an owl! Today the new paints I ordered arrived! I bought a set of Winsor & Newton Professional Watercolours. 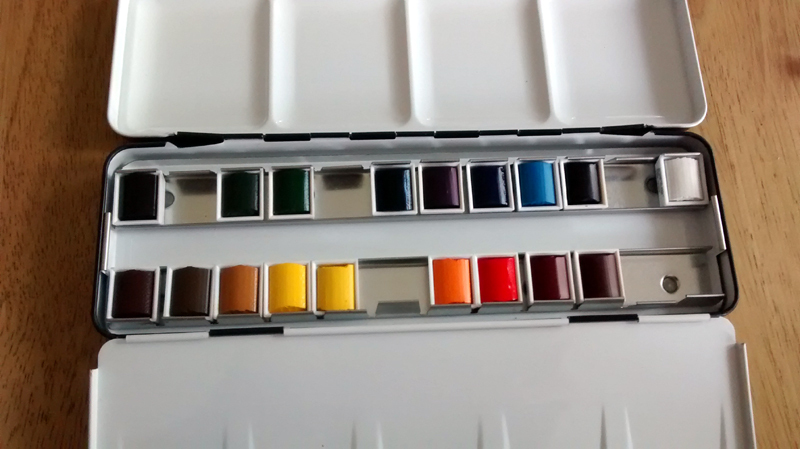 For some reason they give you a selection of paints – not a fixed set of paints – in the set. The set I got was quite good for colour – the only colour I miss is Veridian (a dark bluish green) but I think I’ll buy that half pan (which is the name of the little pot of paint that you buy) seperately. 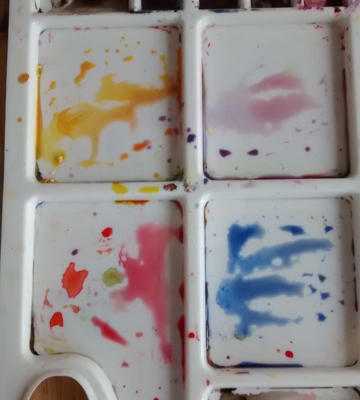 There is plenty of room in the palette. So I unwrapped them all (it was like Christmas!) and put them in the tray provided. This was quite fiddley because you have to adjust the metal in the tray so that each pan is held in place. 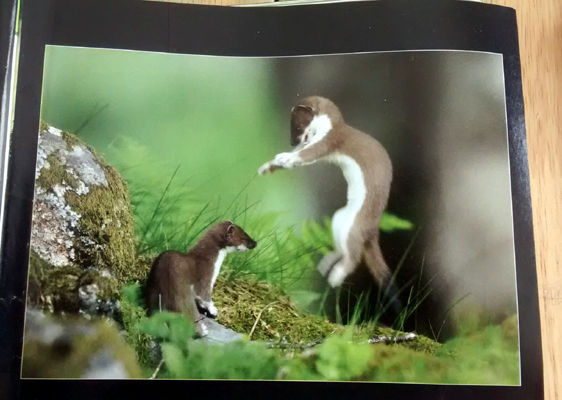 After that comes the most scary bit – trying them out! I had read that the professional colours behave differently to the Cotman colours I’ve been using since I started working with watercolour. There seem to be mixed opinions about this so I wasn’t sure what to expect. Rather than doing a formal watercolour exercise I decided to just paint something a bit more abstract that I usually go for these days. It’s really just an excuse to play with the paint. The colour was much MUCH richer. 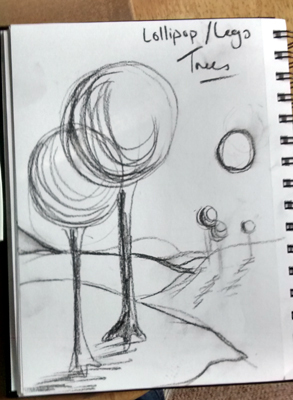 This altered the picture I was hoping to make so, before I finished the painting I decided to sketch the design out again and redo it from scratch with colours which might work better for deeper colour. This is how it turned out. While I’m a bit unsure about the painting – I was very very impressed with how strong the professional colour is but also a bit shocked at how different it is from the Cotman colours. It was really odd painting with these new paints because my internal, mental, index for the hue and tone of the colours I’m using is no longer working properly. The only solution to this, as far as I can see, is to practice and practice and practice with the new paints until my mind makes a new mental map of what each colour can do. Sadly that means that my control of colour and tone will be a bit poorer for a few weeks but I think the results of working with these stronger better paints will be worth the effort. 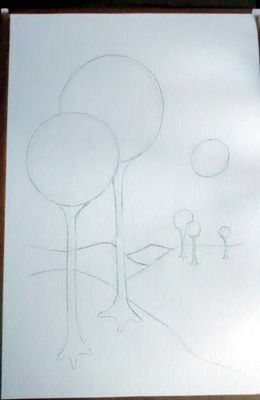 I also got some ‘gummed paper’ to fix my watercolour paper to the board and used this for the first painting I tried. Unfortunately the gummed paper stuck permanently to my painting and to the my board. I will have to sand the board down to get rid of it. I’m going to go back to using masking tape – I think it works much better for what I want. Today I kept looking at the ‘moody sky’ I attempted to paint a few days ago. 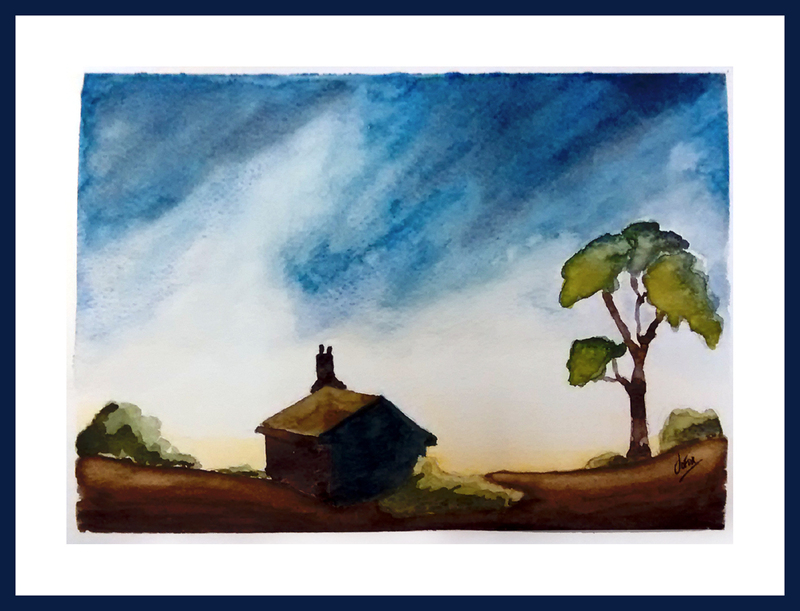 The colours really spoke to me – phthalo blue and cadmium yellow with a tiny bit of green to take the edge off it. But the painting itself was quite poor – the sky was overworked and I didn’t sort out where my light would be until after I’d already painted a lot of it. So I decided to have another go and be much more bold with the sky.